Yemenis Vote for Their Representatives to Fill Vacant Seats in the parliament The Yemeni people in 24 constituencies, which include 453 polling stations in the capital’s Sana’a and a number of provinces, began voting today to choose their representatives that will fill vacant seats in the House of Representatives. The Secretary-General of the Supreme Electoral Commission, Mohammed al-Jalal reported on Yemen’s news agency “Saba” that the process of receiving voters by polling stations is going normally in different centers. He pointed out that the first voter voted at 8 am, according to reports from the constituencies and polling stations. Voters this morning went to electoral stations in 24 constituencies in the capital Sana’a and nine provinces to choose their representatives in the elections to fill vacant seats in the House of Representatives. 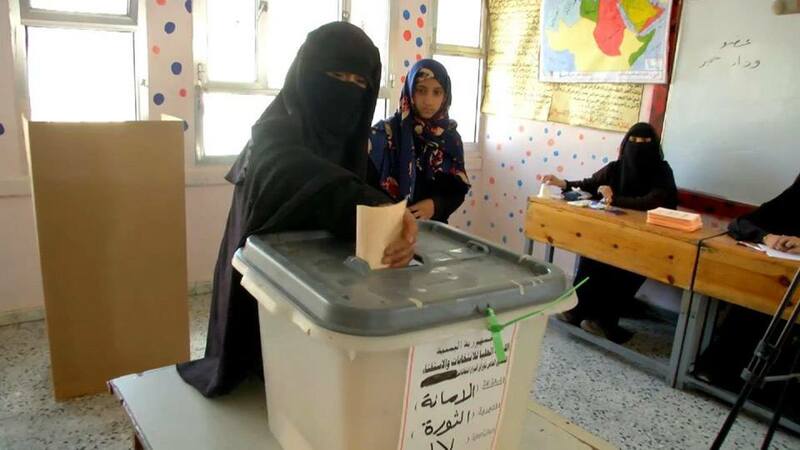 In the Yemeni capital, the head of the electoral supervisory committee, Ziad al-Rafiq, confirmed that the voting process in the vacant parliamentary elections in the 17th constituency is proceeding normally. Moreover, He pointed out that the number of electoral committees in the constituency is 112 committees, noting the level of voter turnout in these elections in which four candidates are competing. In the province of Mahweet, the voting process began this morning in 25 polling stations to elect a candidate that will represent number 242 constituency in the House of Representatives of the Shibam Kokban district. Al-Mahweet province: citizens practicing their legal rights by electing their representative in the House of Representatives Al-Mahweet Governor Faisal bin Haider, Minister of Public Works and Roads Ghaleb Mutlaq, Secretary General of the Local Council Dr. Ali Al-Zaykum, Undersecretary of the Governorate Hamoud Shamlan and Director of Security Brigadier Mohammad Al-Hamzi observed the voting process. The head of the Supervisory Committee in the province, Sharaf Abdul Rahman, said that the voting process is proceeding smoothly and a large turnout by voters in 82 subcommittees distributed in 25 polling stations. The governor of Taiz, Amin Ali Abdullah Al-Bahar, said that the turnout of voters in the elections to fill the vacant seat in the number 33 constituency in the province represents a democratic race and reflects their keenness to exercise their democratic and constitutional right. He praised the citizens’ awareness of the importance of participating in the election of their representative to the House of Representatives despite the difficult economic conditions experienced by the homeland as a result of the Saudi-UAE aggression and siege. The deputy governor of Taiz Mansour al-Lokoumi, the director of the security of the province Brigadier Abdul Khaleq al-Junaid and the Director of Political Security Brigadier Yahya al-Ahrami marked the polling process in electoral stations in the constituency number 33. Moreover, al-Lokoumi praised the committees that run this electoral process with dedication and sincerity according to the law. The Chairman of the Supervisory Committee in the province Abdulkhaliq al-Sarari said that the process of the election is going smoothly within the polling centers. In the governorate of Amran, the polling process began in the morning for the constituency number 289 to fill vacant seats in the House of Representatives. In this regard, the Governor of Amran, Dr. Faisal Ja’man and the Secretary General of the Local Council of the province Saleh Al-Makhlous and the Director of the security of the province, Brigadier General Abdullah al-Arabji, witnesses the process of the elections in various polling stations. The governor pointed to the importance of active participation in this electoral process as entitlement guaranteed by the Constitution and the law .. Calling the supervisory committees, original and subsidiary ones, to abide by the election law. In addition, he pointed out the importance of concerted efforts of various social, parties and official components to make this democratic entitlement successful and in a suitable atmosphere. Governor Ja’man praised the efforts performed to cause these elections to succeed despite the difficulties created by the aggressive Saudi war on Yemen. A woman practicing her constitution right by participating in the elections in filling vacant seats in the House of the Representatives Prime Minister Dr. Abdul Aziz bin Habtoor and Chairman of the Supreme Elections Committee, Judge Mohammad Al-Salmi, inspected the voting process for electing candidates to fill vacancies in the House of Representatives within number 17 constituency located in the Yemeni capital, Sana’a. The Prime Minister and the Chairman of the High Committee, together with the Deputy Prime Minister for Security and Defense Affairs Maj. Gen. Jalal al-Ruwaishan, Development and Economic Affairs, Dr. Hussein Makbouli, the Minister of Local Administration Ali Al-Qaisi and the Secretary of the Capital Hamoud Abbad, inspected the turnout of the voters within polling stations of the aforementioned constituency and observed the process of election. All of the Prominent figures praised the voters’ desire to participate in the elections and practice their constitutional and legal rights, which reflect the finest images of preserving national sovereignty by them electing for electing their representatives in the House of Representatives. The Prime Minister [left] along with other prominent figures “Voters in the vacant constituencies are saying today their words about who represents them and who is entitled to represent them constitutionally and legally,” the prime minister said. The prime minister concluded by pointing out that those who represent the Yemeni people are the citizens who give them their votes, the steadfast ones that stood by the Yemeni people against the Saudi-UAE aggression, not those who sold themselves for the aggression in return for a handful of money. It is worth mentioning that the elections went on without any obstacles and many citizens participated in them. The civilians thanked the committee for the eased process and efficiency of the election.